In her Findhorn studio Susanne offers piano tuition for adults and young people, beginners through advanced students. Having worked in private practice, at music schools and with adult education providers, Susanne brings 30 years of experience to her teaching. Lessons focus on the pleasure of playing while building musicianship, skills and confidence. They include a variety of musical styles, music theory, playing technique and relaxation, improvising and composing according to students’ needs and interests. 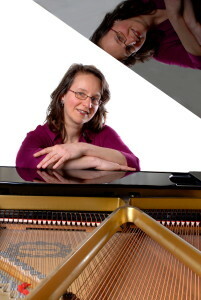 Susanne is a registered member of EPTA UK, the European Piano Teachers Association. She teaches one-to-one, pairs and small groups. It’s never too late to enjoy playing the piano! These group classes offer an opportunity to learn the basics from scratch: getting started with a relaxed touch, learning some easy tunes and basic music reading skills, getting glimpses of music theory and learning how to improvise your own music – all in the supportive setting of a small group. PIANO FOR LATE STARTERS II: for beginners who have had a little bit of input through self study or lessons, however long ago. As a real beginner, I found the Piano workshop liberating, encouraging and great fun. Susanne is an inspiring teacher whose imaginative approach is both original and versatile. She has widened my horizons and taste in music, and her approach to teaching is relaxed and encouraging. Thank you for bringing enjoyment back into my piano playing!